A Honda Civic Tourer has set a Guinness World Record for fuel efficiency by averaging 100.31mpg during an 8,387-mile drive covering 24 countries. The amazing journey sets the record for lowest fuel consumption in ‘all 24 contiguous EU countries,” with the car setting off from Aalast, Belgium, on June 1st and returning to the same place on Thursday June 25th. 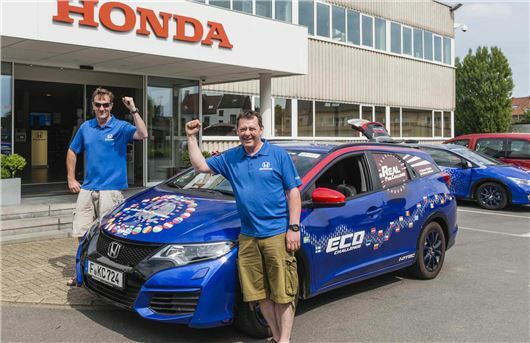 The distance the team travelled is the same as driving from the UK to Australia, and in the hands of two members of Honda’s European R&D team, Fergal McGrath and Julian Warren (pictured), the car achieved a 932-mile tank average. That means that the entire fuel cost of the 1.6-litre i-DTEC diesel car was just £459, with the Civic’s official 74.2mpg average mpg rating surpassed by more than 25 per cent. The rules of the record attempt stipulated that the two drivers had to be in the car for the entire journey, travelling around 380 miles and up to eight hours per day. There could be no modifications to the car whatsoever, including tyre pressures and it must be filled to the brim at each fuel stop. Honda says that it was only the careful planning of the amateur drivers, along with the Civic’s outstanding efficiency, of course, that allowed the drivers to reach the dizzying post-100mpg economy heights.